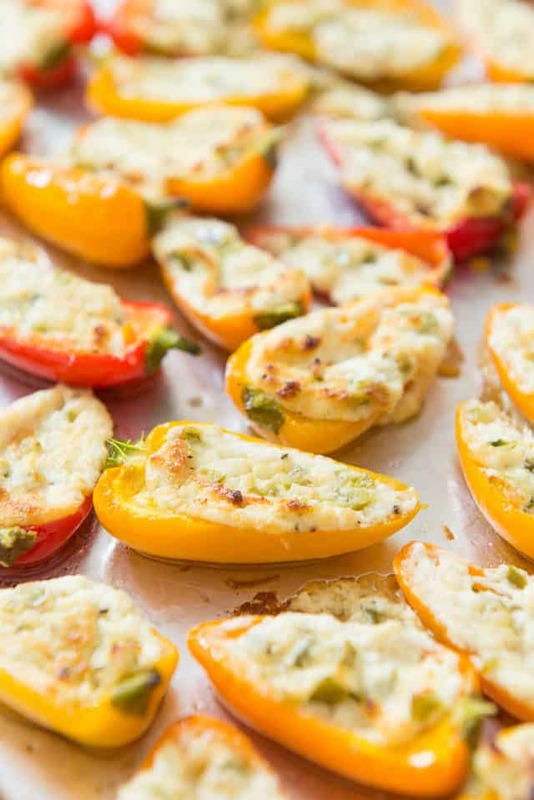 Stuffed Mini Peppers are a delicious appetizer that’s like a healthier and less spicy version of a jalapeño popper, and they can be roasted in the oven or cooked on the grill! 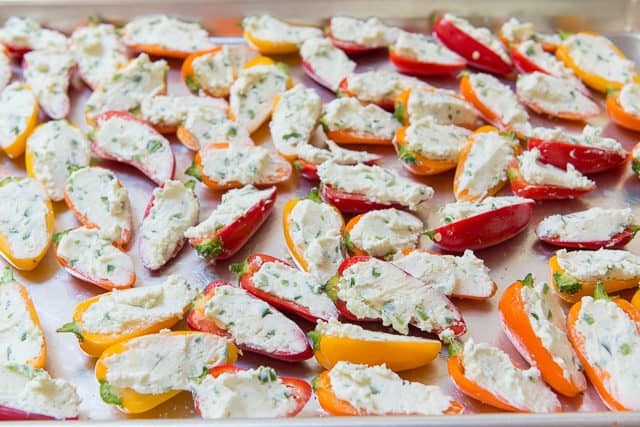 It’s crazy how delicious these mini stuffed peppers are because they’re quite simple. But every time I make them, the entire tray gets completely demolished. They’re sooooo good. I’m a big fan of stuffed peppers in general, and have done both Bacon Wrapped Jalapeños and Stuffed Hot Cherry Peppers on the blog. As much as I love those two recipes, what’s nice about this recipe is that you can control the spiciness. When you’re about to bite into a whole stuffed jalapeño, there’s no way to tell how spicy it’s going to be, and there were just too many times when my mouth was on fire!! It got to be too much, hah! 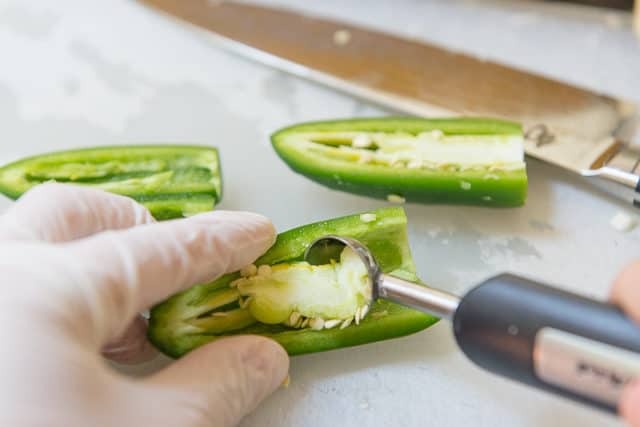 But here you get a sweet, mild pepper experience with a touch of jalapeno in the filling, so you get that heat and flavor in a tempered way. 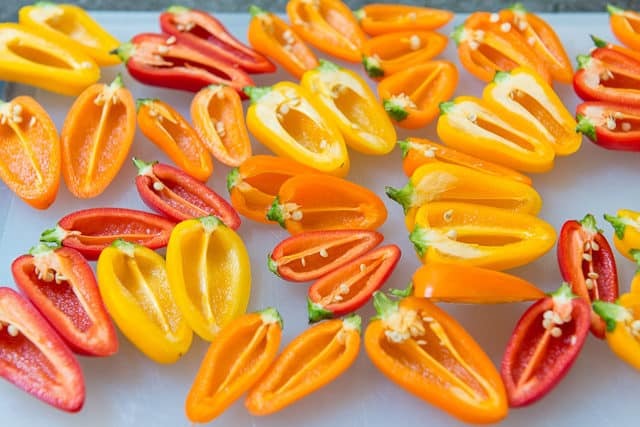 So, if you’re looking for an easy but delicious appetizer that’s also really colorful and pretty, these peppers are fantastic. When I make these for a party, I keep the tops on because I think it looks pretty, but you can cut those off if you prefer. There should be just enough to fill each pepper half generously. If roasting in the oven, cook for about 20-25 minutes in a 425 oven. I sometimes cook these in my Traeger to add a wonderful smoky flavor. I cook on high for about 30 minutes, until the cheese is bubbling and the peppers are soft. For a hotter charcoal grill, try to make sure the heat isn’t above 450, and cook for about 15-20 minutes. Smoked Salmon Spread, Bacon Wrapped Water Chestnuts, and Buffalo Chicken Dip are some of my other favorite party appetizers, and you can see the full collection in the Appetizers section of my recipe index. Happy cooking! 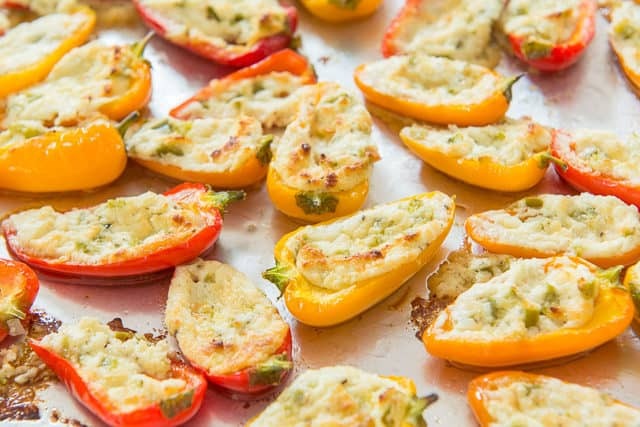 Stuffed Mini Peppers are a delicious appetizer that's like a healthier and less spicy version of a jalapeño popper, and they can be roasted in the oven or cooked on the grill! Preheat the oven to 425F*. De-stem the peppers, then cut each in half. Place in a bowl with the olive oil and 1/4 tsp of salt, and toss well to coat. 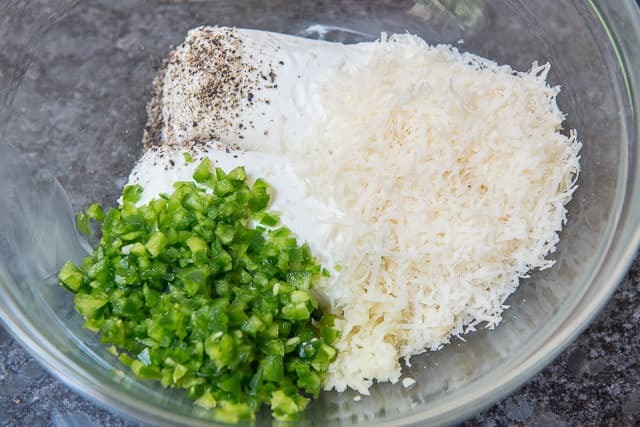 In a large bowl, stir to combine the goat cheese, parmesan, garlic, jalapeno, and black pepper. 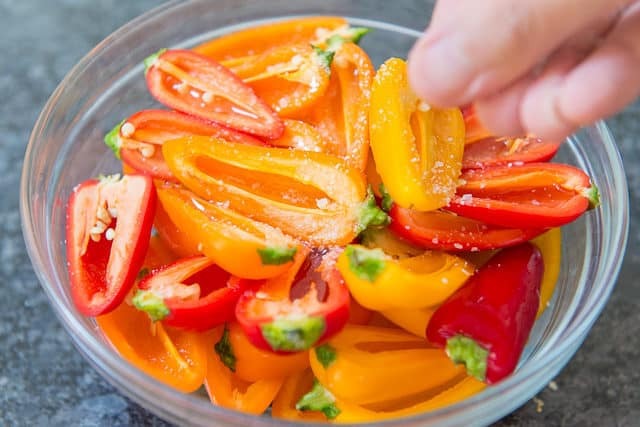 Fill the cut peppers with small spoonfuls of filling. 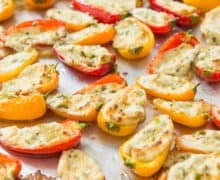 You should have just enough filling to fill the peppers with a generous amount, coming slightly over the tops of the peppers. 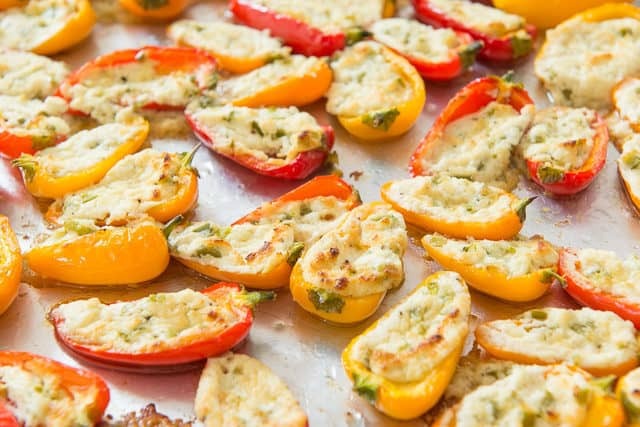 Roast the peppers for about 20-25 minutes, until the peppers are soft and the cheese is golden on the edges. Enjoy! *For other cooking methods, you can also Traeger these on high for about 30 minutes, or on the grill for about 15 minutes. You're going for doneness more than time, with a soft pepper and slightly golden filling. Leftovers still taste good, but it's never as good as the first time when they're freshly cooked. Feel free to halve, double, or scale this recipe as desired. We didn’t have goat cheese, so we used shredded cheddar instead. In addition, we added a pinch of cayenne red pepper. These were outstanding!! We and all our friends love this recipe. 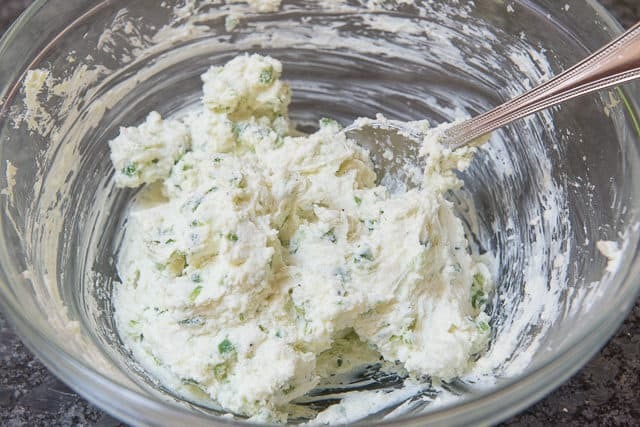 I cut goat cheese 50/50 with cream cheese and add a little fresh lemon which tempers the tartness of the goat cheese for some of our family. Any way you do it, this is an awesome recipe. Thanks so much for the inspiration, i pull this up often when I can’t remember the ingredients. Another thing i do is get my Italian seasoning or dipping spice from a local mom and pop Italian market, an extra special twist. Cheers!